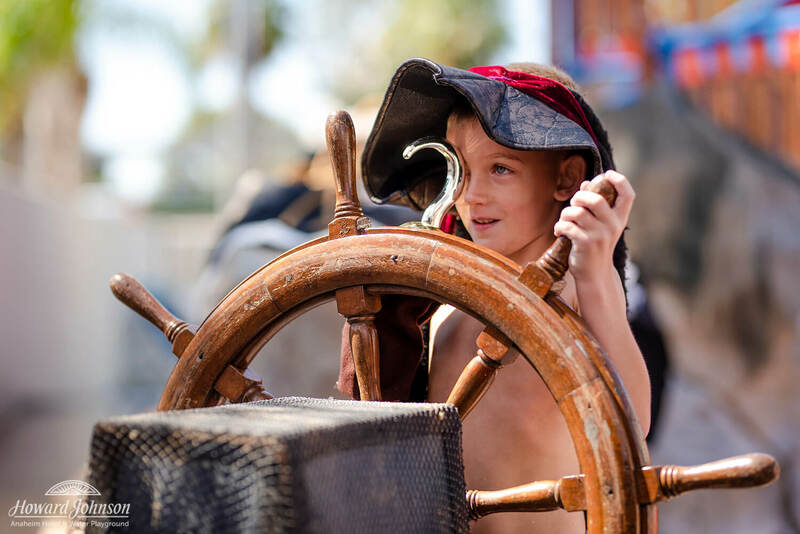 Avast there, me hearties! Last week ye olde crew at HoJo Anaheim celebrated Talk Like a Pirate Day with a mighty fine gathering of our hotel guests and invited buccaneers! 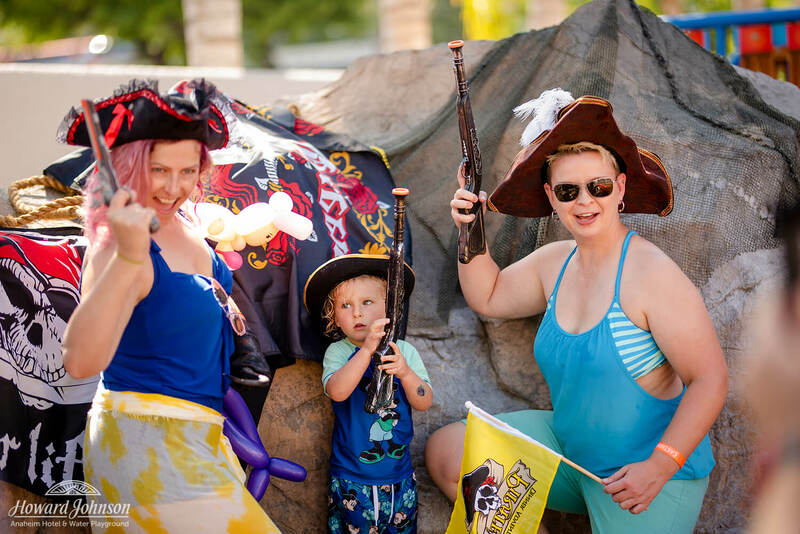 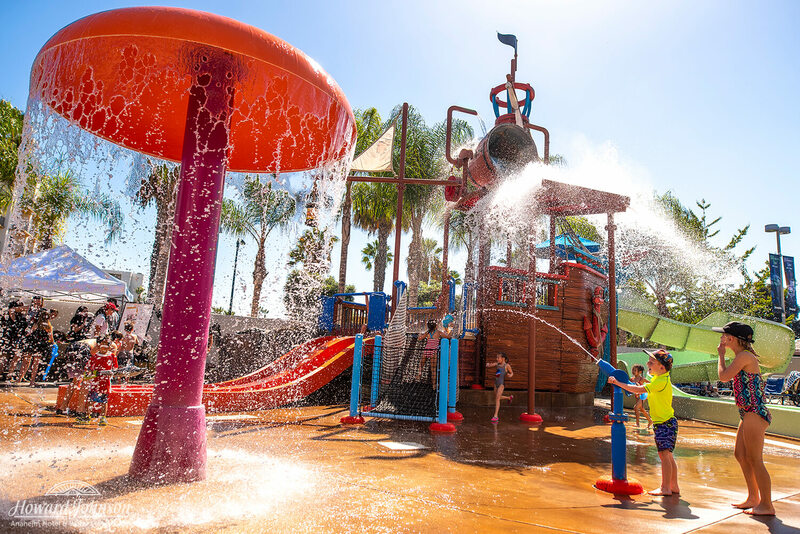 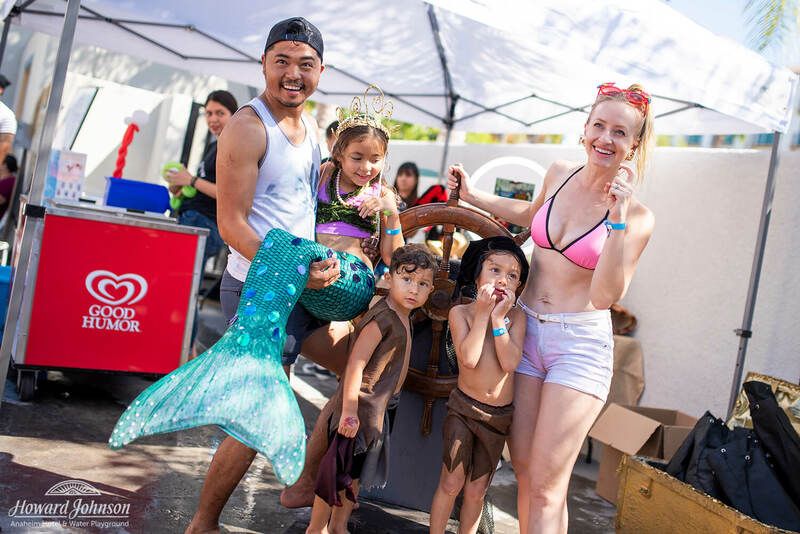 Our very own Castaway Cove pirate-themed water playground was the perfect place to celebrate such a seaworthy occasion. 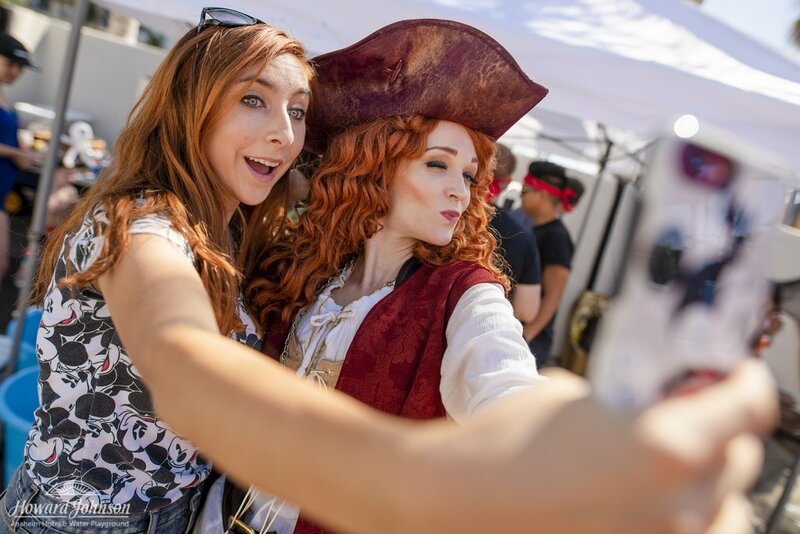 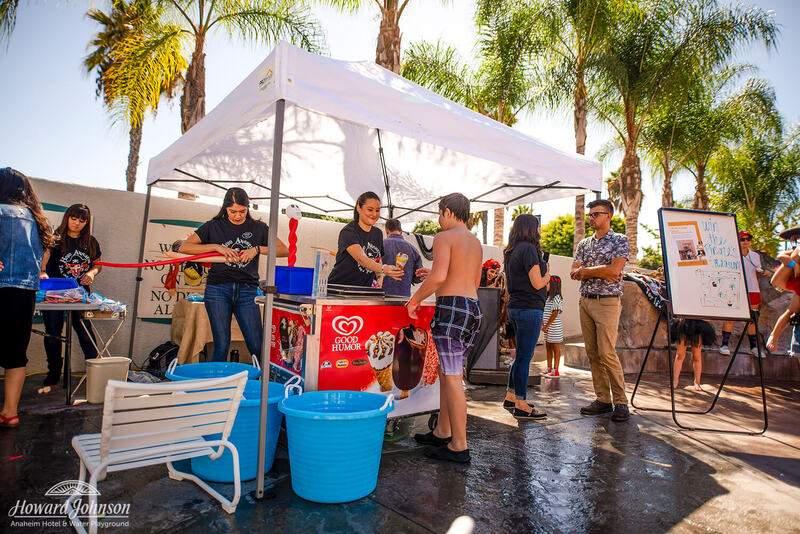 HoJo guests were treated to free drinks and ice cream, invited to hang out with a pirate, prize giveaways, fun piratey photo ops, and more! 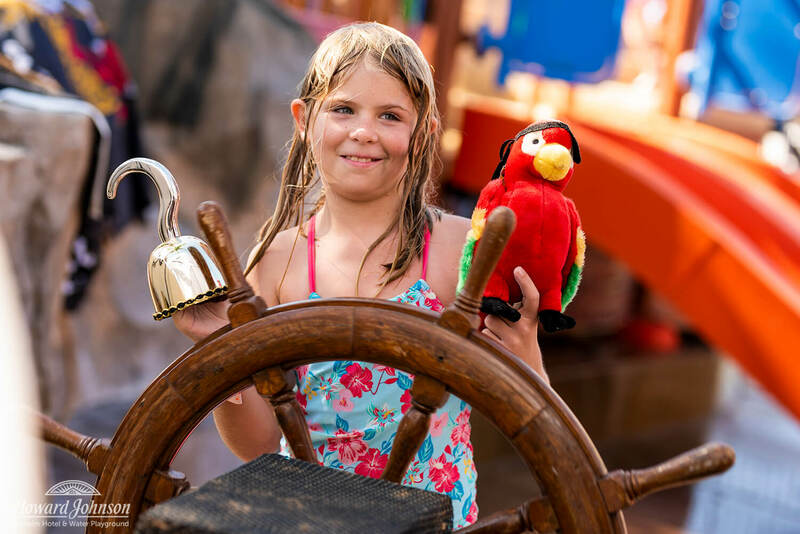 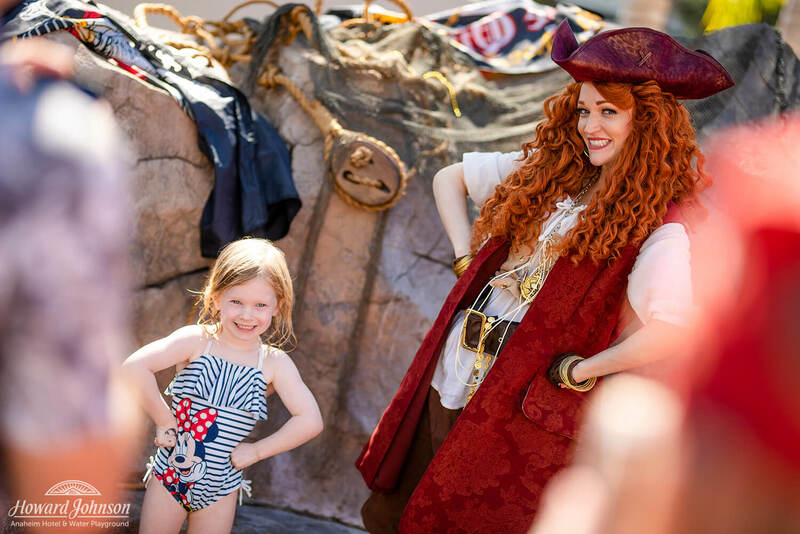 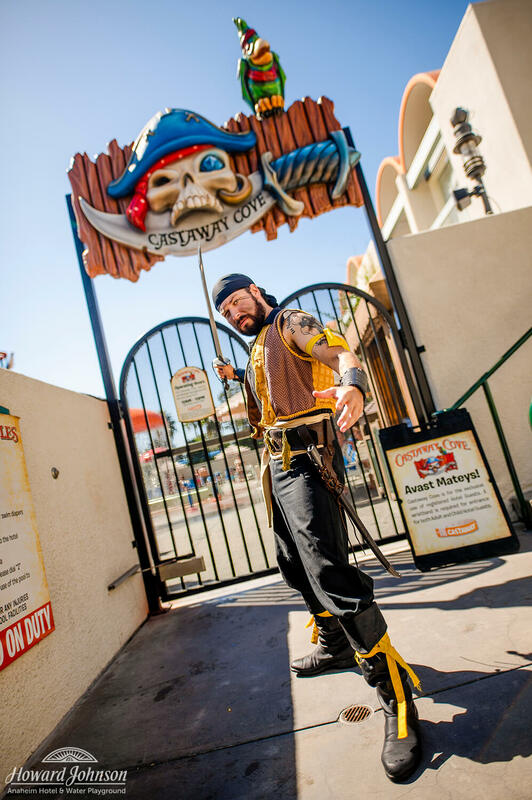 The weather was excellent for a swashbuckling day at sea — or at least on the decks of Castaway Cove! 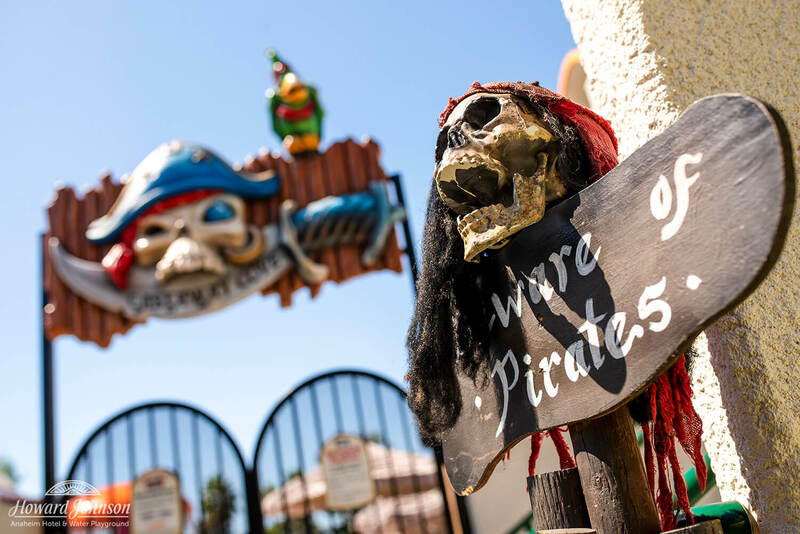 Pirates, wenches, privateers and scallywags alike could step up and enjoy a free beverage or a frozen treat as part of our celebration. 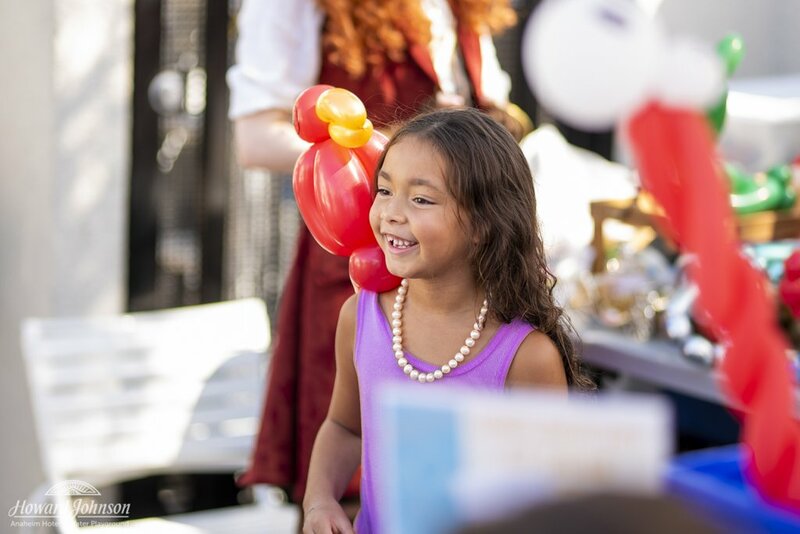 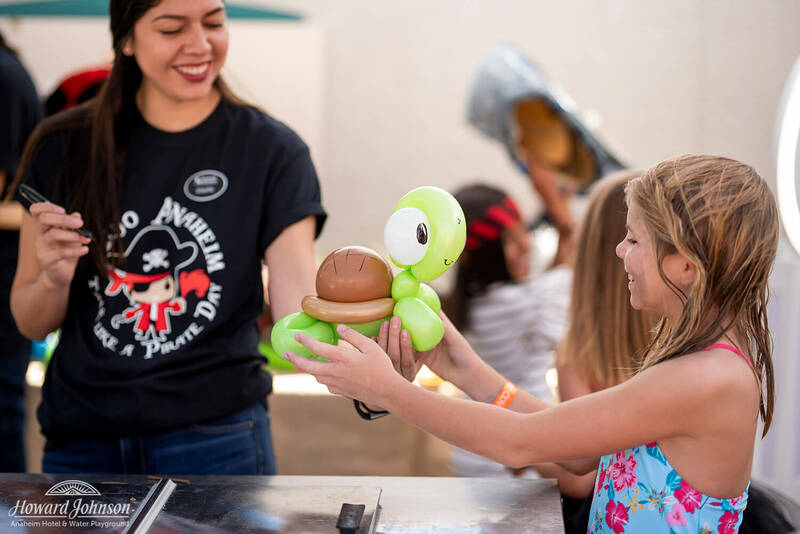 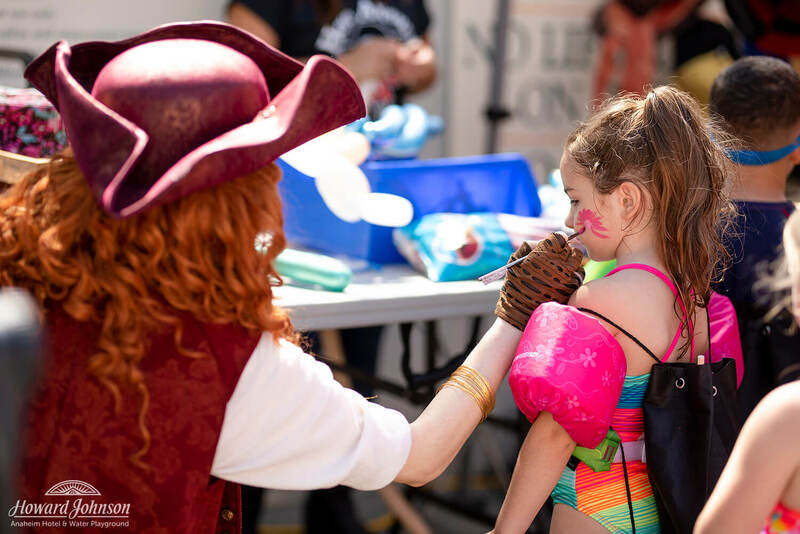 Balloon swords, mermaids, and sea turtles were available for our little swashbucklers! 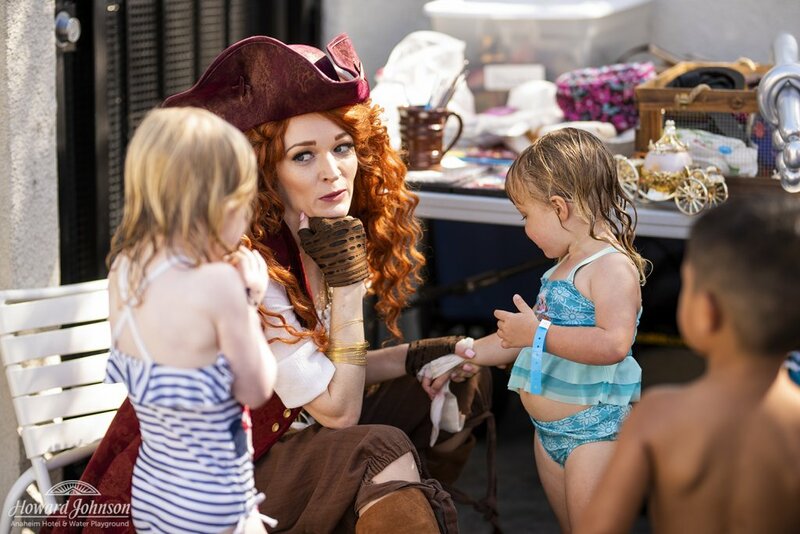 Little pirates also enjoyed free face painting by Pirate Bonnie, our own pirate wench! 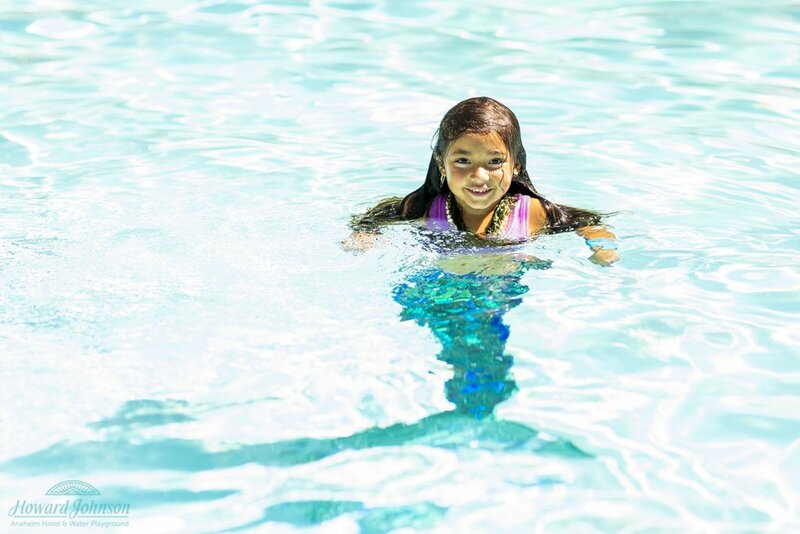 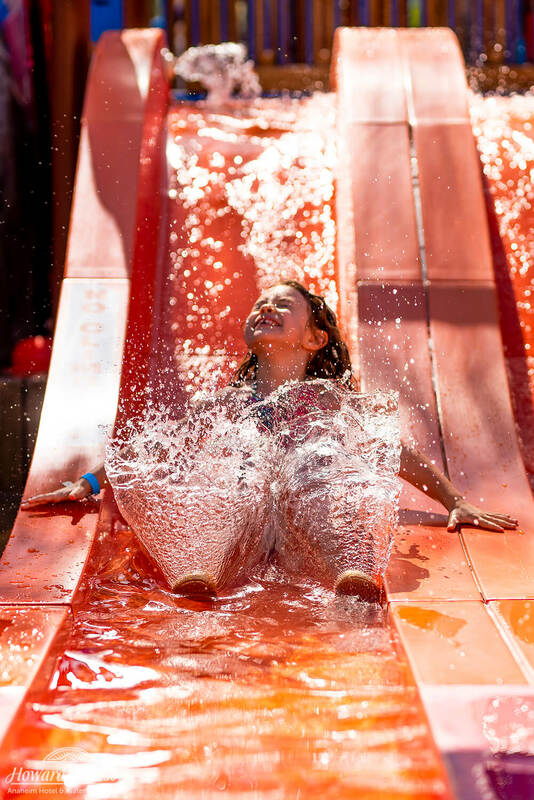 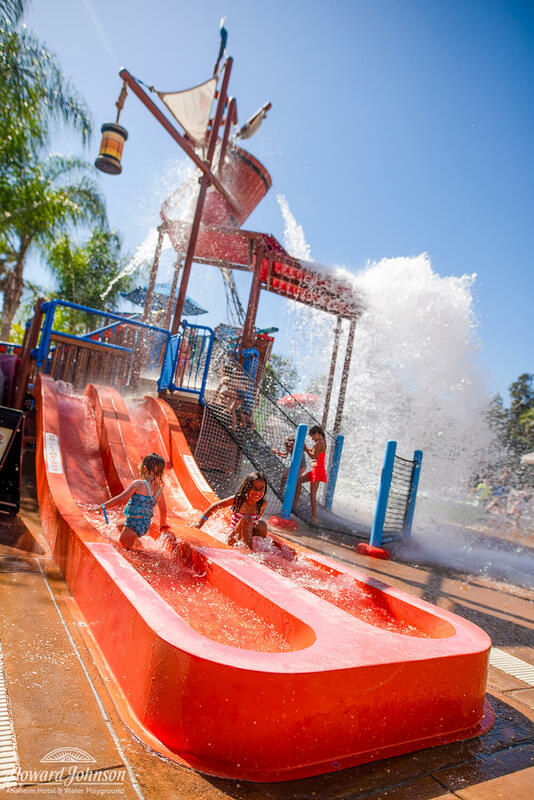 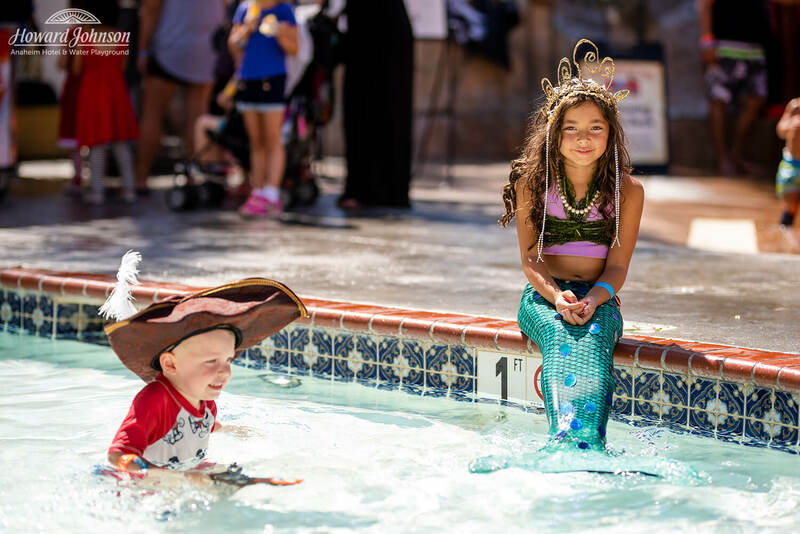 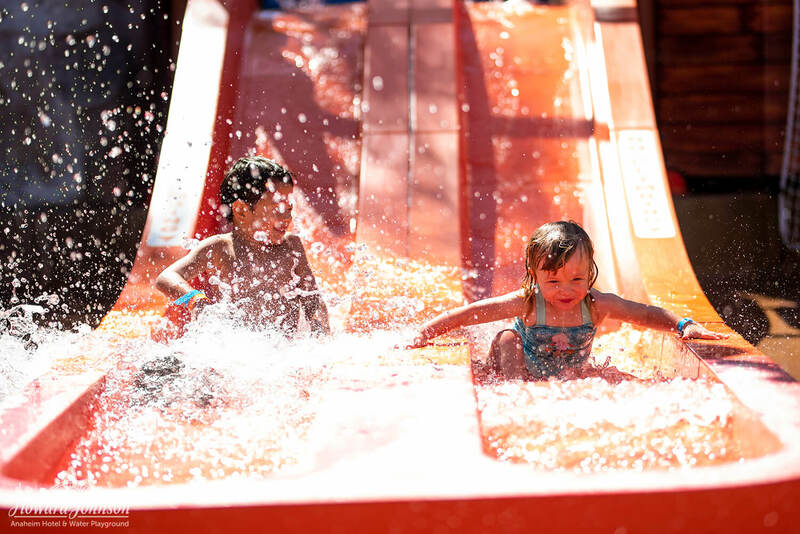 Little mermaids and young captains alike shared the pools and enjoyed the Castaway Cove water slides. 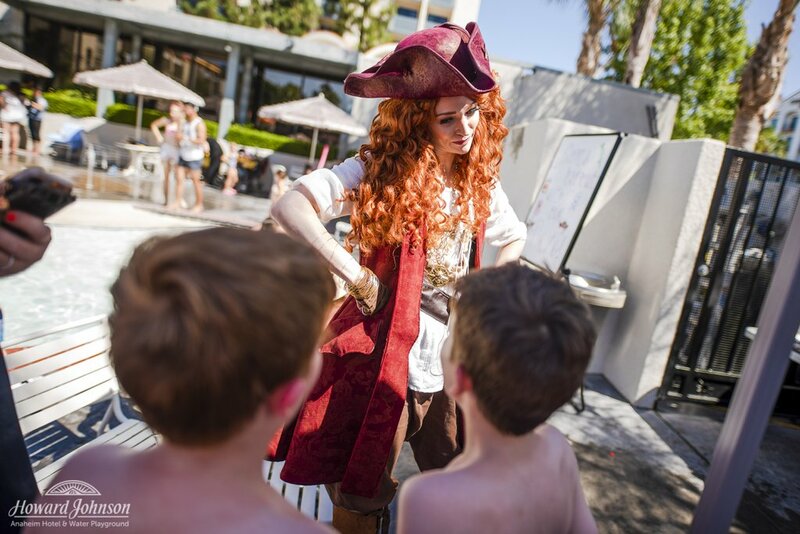 Inside our Building 1 Tower, our guests were invited to come ashore for a special treat! 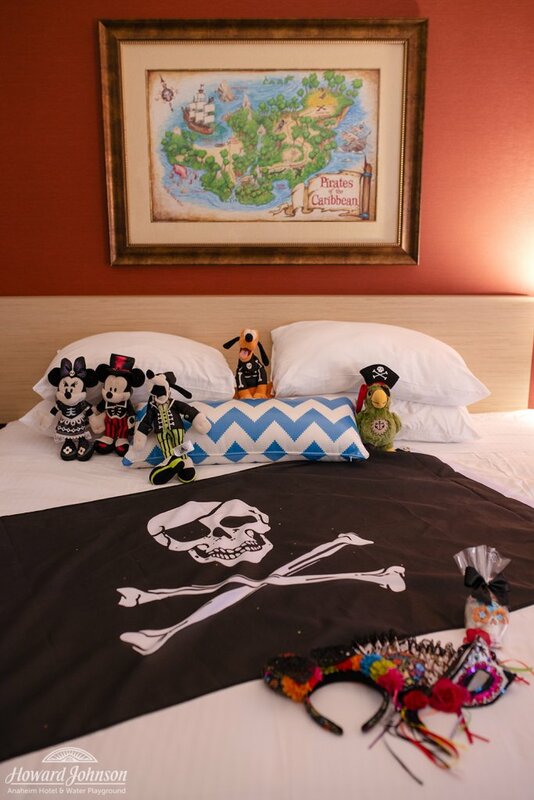 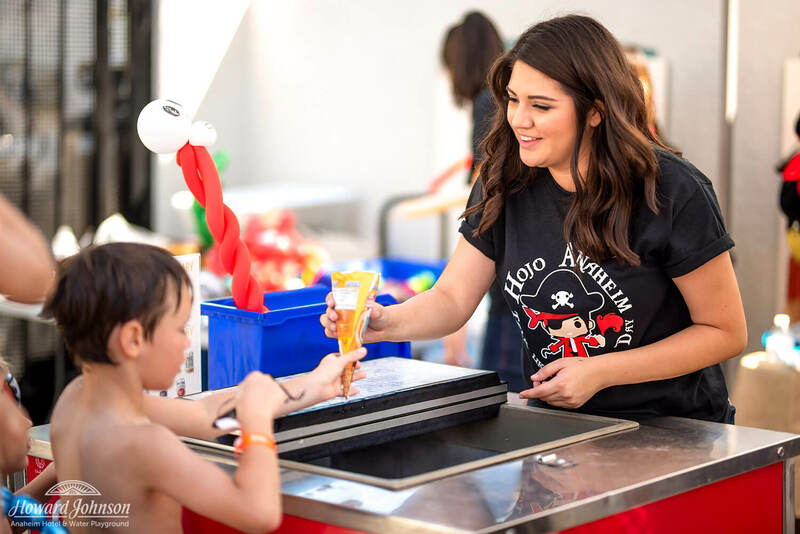 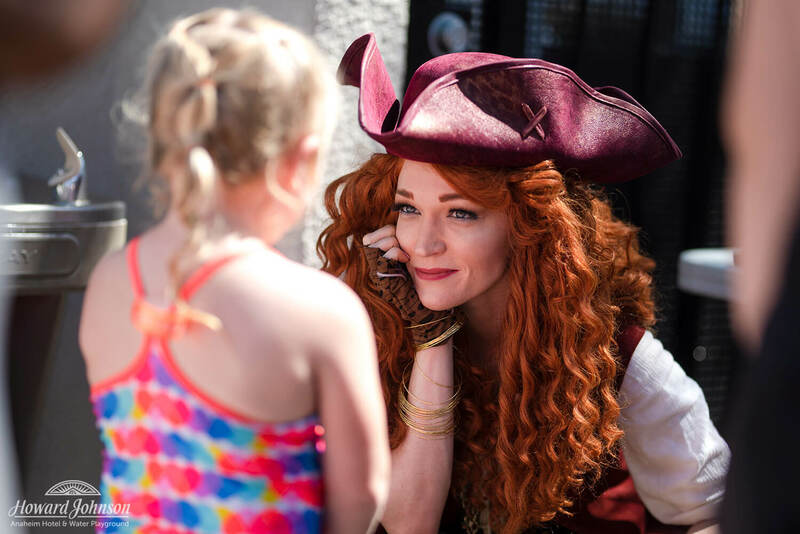 Our friends at Pixie Magic had transformed one of our pirate-themed Kids’ Suites into a festive pirate party for all to enjoy! 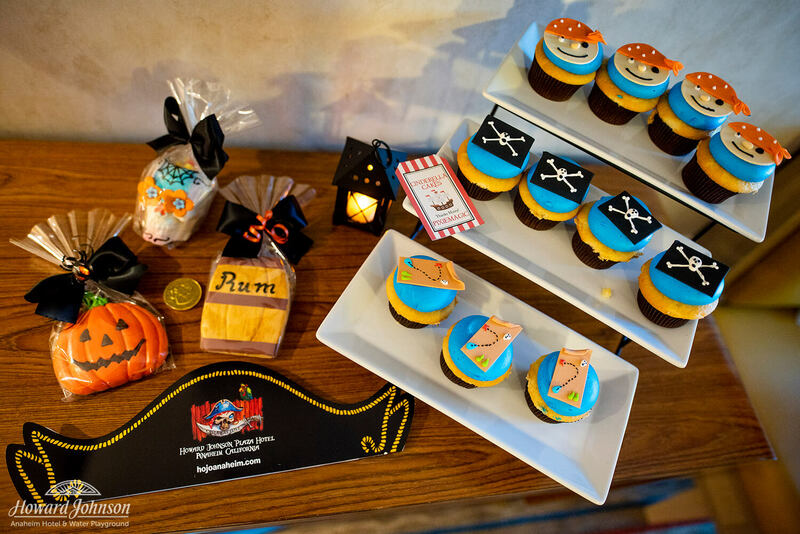 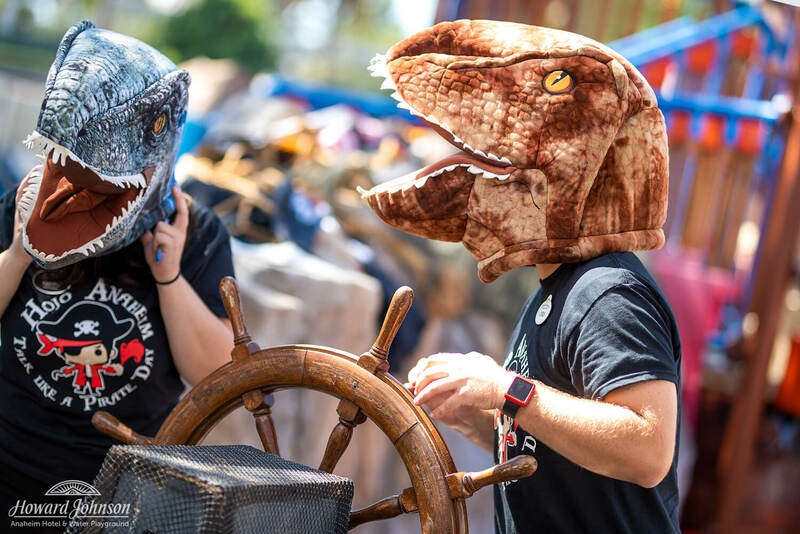 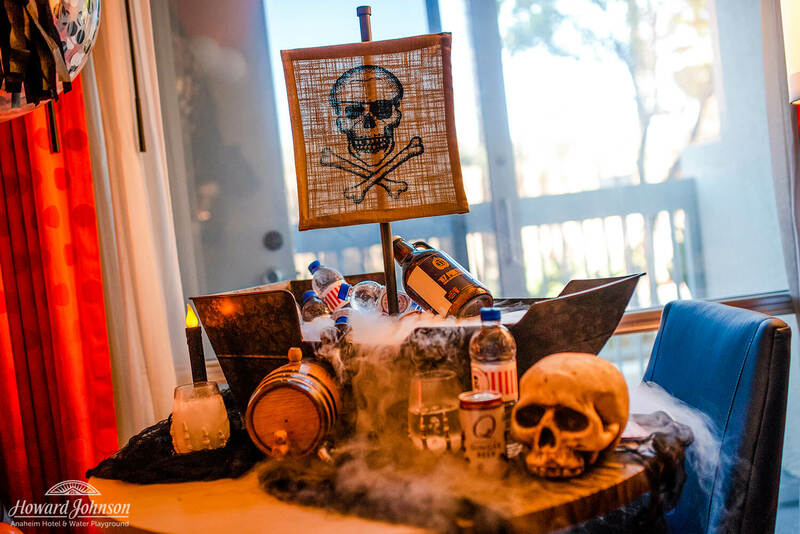 Pixie Magic delivered a treasure trove of pirate’s booty with themed plush, pirate loot, special treats and drinks making this special suite even more amazing than usual! 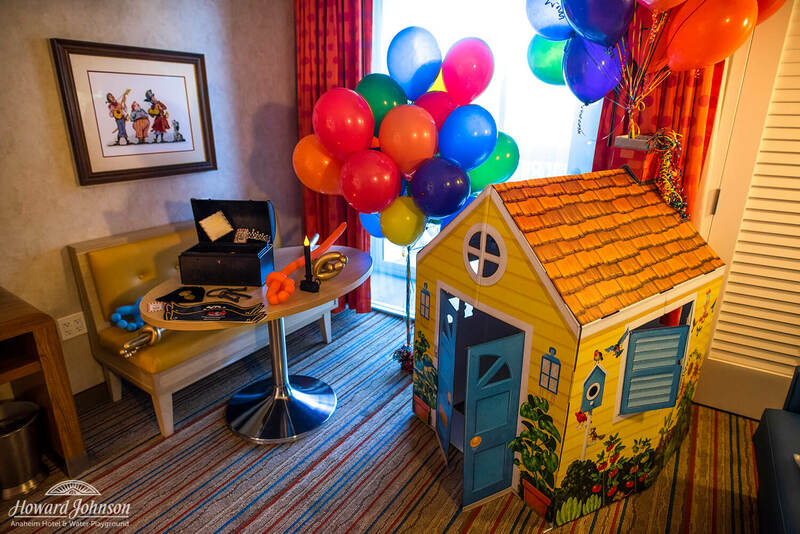 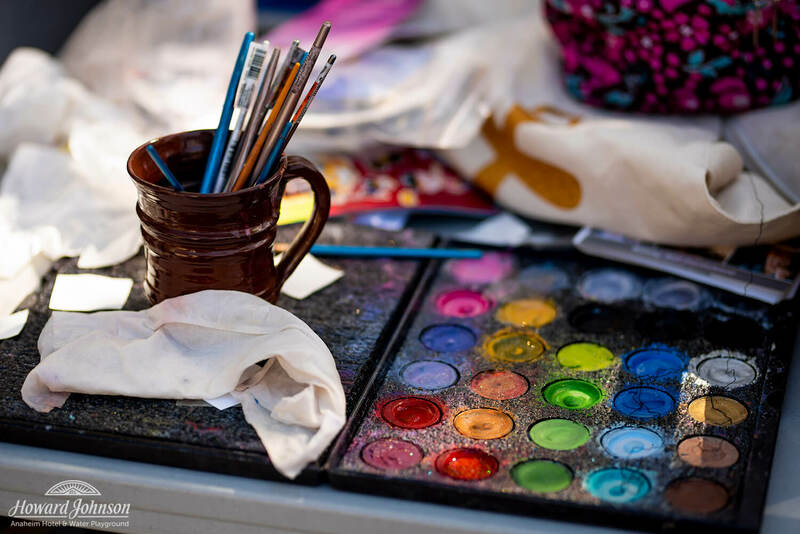 For more information on what Pixie Magic does, check out our recent post about their services and in-room celebrations! 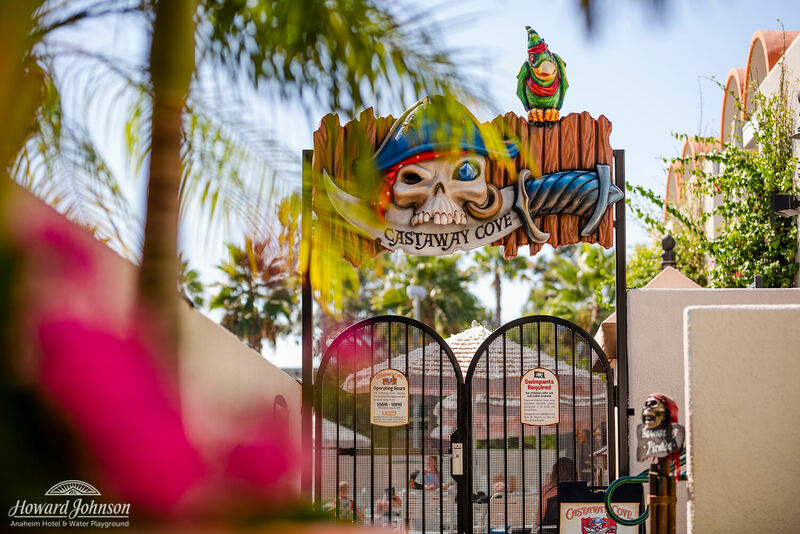 Back at Castaway Cove, our guests and HoJo staff alike had a blast throughout the afternoon! 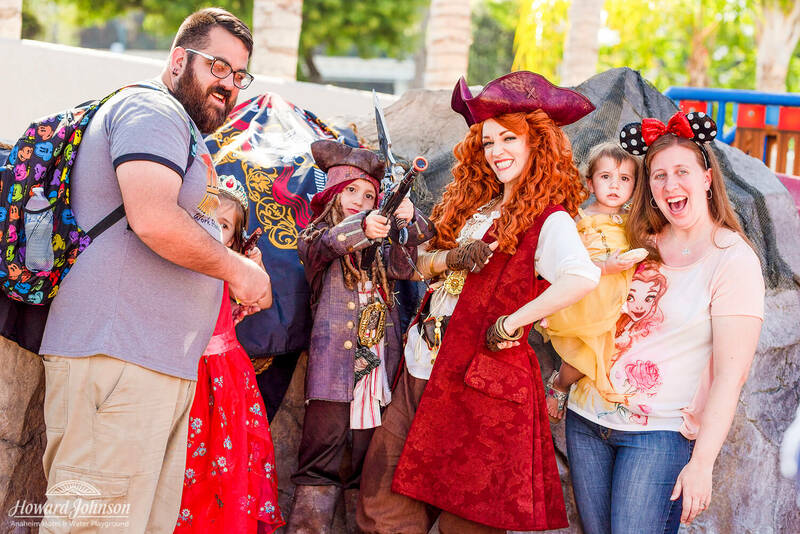 Everybody enjoyed soaking up some of So Cal’s spectacular late-summer sun and posing for photos with our pirate friend! 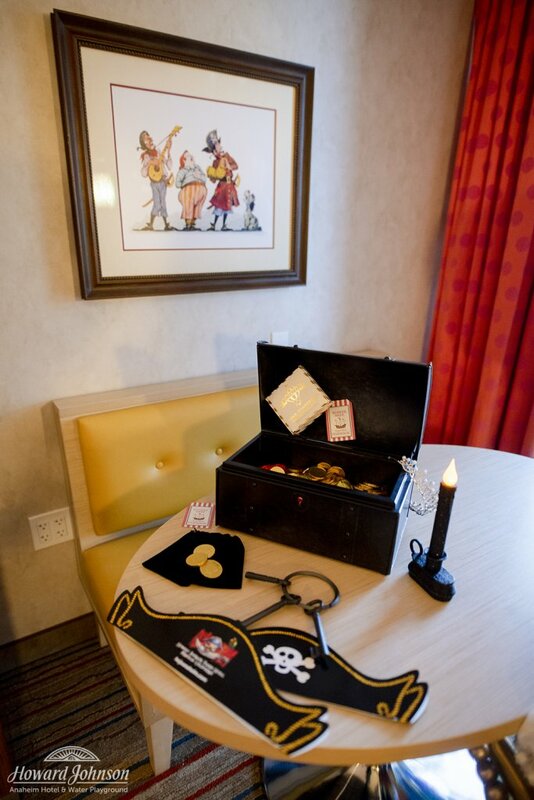 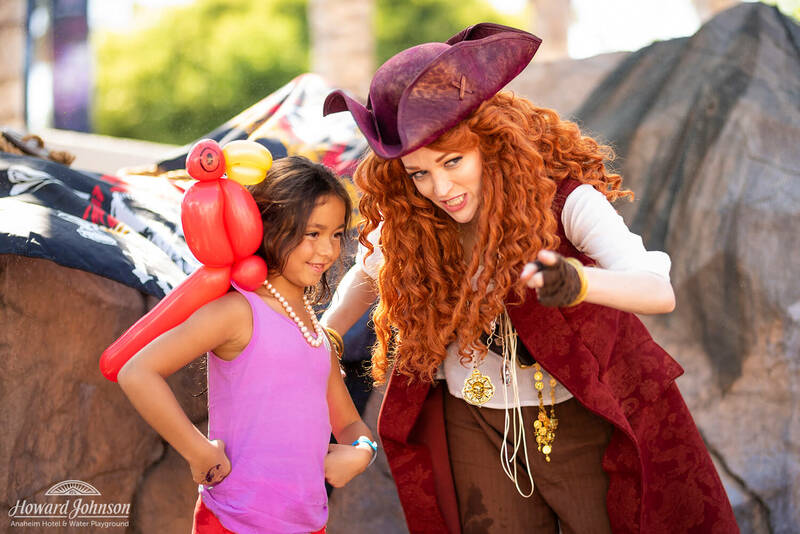 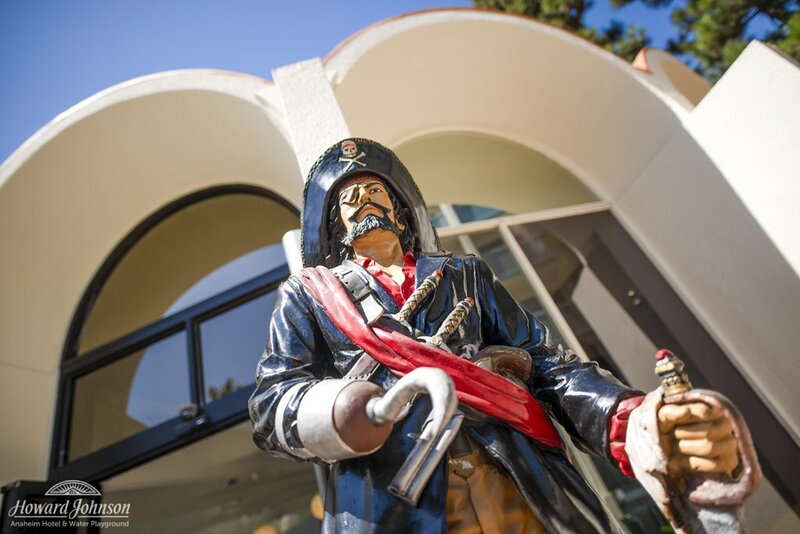 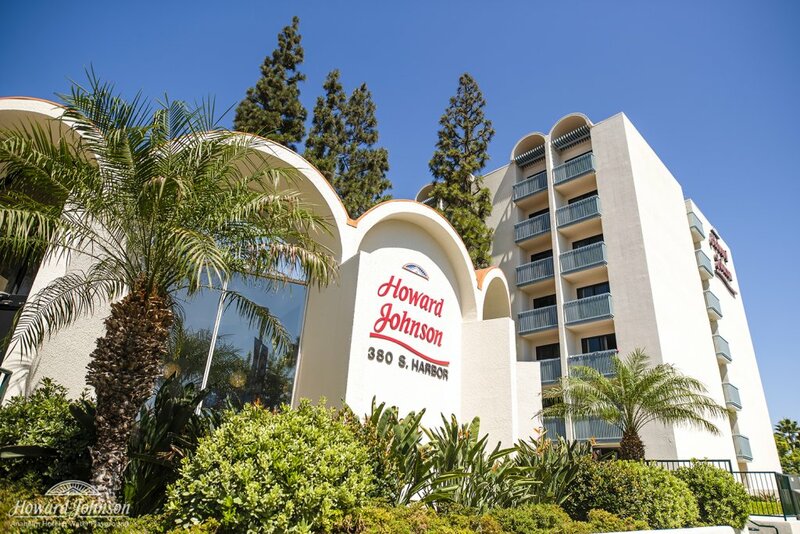 As you can see, our annual Talk Like a Pirate Day celebration is a great example of our continued dedication to making sure your HoJo stay is packed full of extra fun and magic that you just can’t find anywhere else. Want to join the fun? 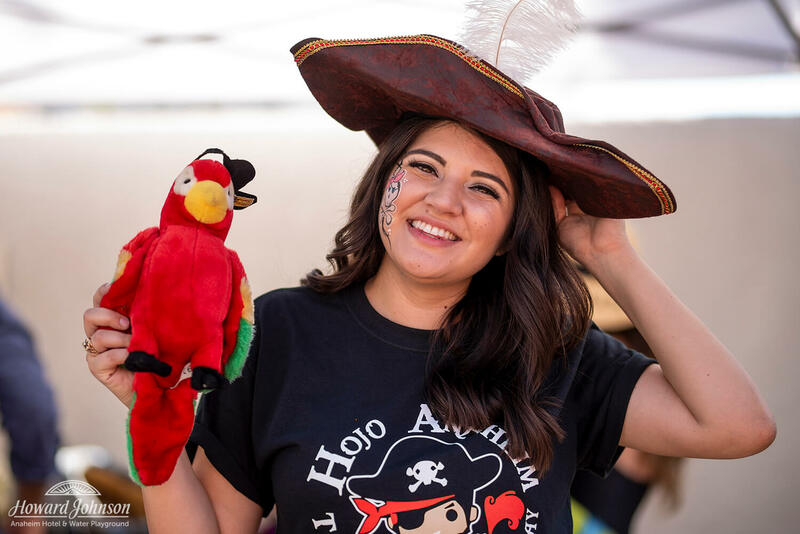 We’ll be doing it all again next Talk Like a Pirate Day along with special events and gatherings throughout the rest of year. Just ask the front desk staff if there are any fun events coming up when you call to book your stay! Arrgh!